Like in any project, there are always different views between developers as to how something should or shouldn't be done. But as of recent, I noticed a trend regarding plans to remove core weapons, which I consider very harmful. I believe this should be discussed in depth and clarified. Some players think there are too many weapons and we should lessen them, either by removing core weapons or merging their functionality. I suggest finding other alternatives, and making all weapons useful and different while finding easy and fun ways to teach new players how to use them all. Some players and developers believe there are too many weapons in Xonotic. There's been a lot of talk about removing them... including core weapons that Xonotic and Nexuiz had since they existed. It's not because some weapons are too similar to each other in functionality (I'll expand below) but because newbies find it hard to learn how they all work. It started with Samual's proposal to merge the Laser and Shotgun... which was thoroughly discussed, stirred a lot of drama, and I don't wish to get into it any further. Samual also proposed removing the UZI in favor of his new Lighting Gun. While I love the idea of this gun, I see no logic by which it should replace the UZI. The UZI shoots bullets at a specific rate, while the Lighting Gun would shoot a constant arch of electricity which would behave quite differently than a bullet stream. I believe this initiative to remove and merge as many weapons as possible needs to stop, and instead an useful way to deal with multiple weapons found. I'm all for being newbie-friendly... but simplifying the weapon system so people can learn to play more easily is plain wrong. The high amount of weapons is one thing that makes Xonotic unique compared to other games (Quake, Unreal Tournament) and makes it larger and more complex. It's a positive thing we should be happy about, not something we should be getting rid of. In the past, people were complaining that weapons are too similar in functionality, not about their number. This is a legit concern I fully agree with. But the correct solution is changing how weapons behave to differentiate them first, not blindly removing and merging. For example, the Seeker is too similar to the Hagar; Instead of either removing the Seeker or giving the Hagar guided rockets, why not use a constructive and original idea to make the Seeker feel different? Having a weapon with guided projectiles is good and unique. We're choosing the easy way when we don't need to, and also disregarding style over gameplay. Some developers worry there's too much code to maintain, while certain players prefer having few weapons that play well... disregarding that fewer guns means less complexity and variation, which means less fun. Weapons should also be divided into different categories / themes (represented by ammo type), and I like the 3 basic ones being bullet weapons, plasma / energy weapons, and rocket / fuel weapons. I'm not aiming to disregard those who are having a hard time learning all the guns (though I don't see why that would take more than a few hours). One solution is making a tutorial map that walks the player through all guns, containing a room for each weapon and a bot you can use for training + instructions and information about that weapon (with free access to each room, possibly a central arena too). If anyone else wants, I'll gladly make and maintain such a map on my own. I also thought about weapon profiles (configurations using weapon replacement cvars), but that's probably a deeper subject for another topic, and might be a bad idea too. Feel free to post your own thoughts and what you think would be a good alternative to removing the core weapons. I really hope we can think of a good way to use the guns we have instead of wanting them to go away. I think there is a need for more weapons to use the shotgun ammo - there are 4 types of ammo in the game and it would be good to have an equal amount of core weapons that use each type. (09-03-2012, 08:00 AM)Cyber Killer Wrote: I think there is a need for more weapons to use the shotgun ammo - there are 4 types of ammo in the game and it would be good to have an equal amount of core weapons that use each type. My suggestion was to remove shells and switch the shotgun to bullets (same as the uzi) since there's really no need for two bullet type ammos. Then split cells so we'd have a second ammo from it (an electric ammo perhaps) or maybe put fuel in the HUD and allow it to be used by many weapons... so overall we don't go under 4 ammos. Samual however wanted to remove bullet weapons and the bullet ammo type completely, which I disagree with. I guess this might take some thinking. Personally, I don't like current MG and LG can't come fast enough. I'm very much for dropping uzi from core set and reworking it into something more interesting. 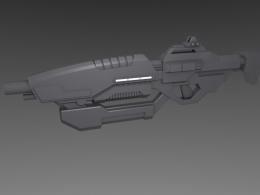 Chaingun was mentioned because I like the idea - big, bad gun with hefty dps, but also awkward to use. Current uzi has little going on for it and LG, if properly balanced, would do all uzi does, but better (except maybe for long range secondary, but that mode is weak on uzi too). Still, that would not be a core weapon. As for tag seeker I'd imagine it to be made into sth anti-vehicle - working well against vehicles, less so with humans. Xonotic currently lacks such a dedicated weapon, so it could be a slot well utilized. And for spawn weapon, I was never excited over it, but there are some recognized problems with current system, one of which was mentioned (SG being the only one using shells) and also SG being OP for a spawn weapon in general. I agree with making the UZI a larger weapon (new model, sounds, and effects) while leaving core functionality as is at least for primary fire. Chaingun sounds like a really good idea... something like Halo's machine gun would also be awesome (great gun design there) or even UT's minigun. I also suggest renaming it, since UZI is a really bad name IMO. But not with dropping it from the core weapons set, or turning it into an entirely different weapon (in terms of weapon type and functionality). The ideas mentioned are a good example of "improving instead of removing"
Speaking of the UZI model: Someone on another thread reminded me of an old mesh which IIRC theShadow made, that looks pretty sweet. I wonder if I can download the latest version anywhere, and perhaps try to texture and ready it.